I just released a new version of nbody, v1.74. This is a minor release which is backward compatible. Please let me know if there are any issues. Message 67953 - Posted: 20 Dec 2018, 2:16:08 UTC - in response to Message 67949. There appears to be an error in the generation of the work units associated with this release. We are working on fixing that currently I will post updates here. Looks like everything is all fixed. Give us an update if you see any issues throughout the next day or two. I get one the is fine, finishes in 35 mins the next one that's running 12 cpu cores and takes 36hrs. Been happening now for the past week or so. Message 67985 - Posted: 5 Jan 2019, 10:12:09 UTC - in response to Message 67984. Very different run times are normal for n-Body, just don't abort them and eventually decrease your cache size since you have some "Not started by deadline - canceled" WUs. You have an average turnaround time of over 7 days, for some of the applications even almost 10 days, that's way to high for Milkyway. Message 68165 - Posted: 17 Feb 2019, 2:32:38 UTC - in response to Message 67985. I just started using N-body work units again after a few years. 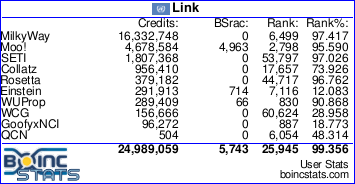 A work unit that originally said it would complete in 18 hours on a 2-CPU system (50% of 4 CPUs) has taken almost three days so far and is about half finished (Host name: DESKTOP-QKT2DLD has BOINC Versiom 7.14.2). I suspect at least one or both CPU threads are stalled maybe waiting for a join based on very low CPU usage. I just turned off N-body apps in Milkyway Preferences temporarily because one system is a laptop and I prefer shorter work units. That laptop only allows one CPU (25% or 4 CPUs) so I was not expecting it to get N-body work units assigned! If I can help, please send me a private note. I am familiar with parallel processing and native code app performance analysis, so I am curious what is happening.